NEW LOOK! - NEW FORMULA! 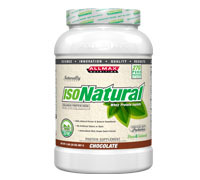 IsoNatural is a pure whey protein, with no artificial flavor, no sugar, and no color added. IsoNatural contains 25 of pure whey protein in every scoop, is virtually fat free, contains less than 1 gram of carbohydrates and is 97% lactose free. IsoNatural is now available in three delicious new flavors! IsoNatural is now available in three great flavors – Chocolate, Vanilla and Strawberry. The new flavors deliver exceptional protein quality with the highest (BV) Biological Value available. They are 100% aspartame-free, non-GMO and Gluten Free. Artificial sweeteners are never used in processing IsoNatural, as It is sweetened Stevia; a natural herbal extract. IsoNatural is also fortified with NutraFlora®, a unique patented Prebiotic ingredient that enhances calcium absorption while supporting a healthy immune and digestive system. This pure and natural formula has also been fortified with two synergistic complementary complexes; Grape Seed Extract and Acerola Cherry Extra. These two protective antioxidant complexes provide protection against cell-damaging free-radicals while providing 15% of the body’s Vitamin C requirements. IsoNatural mixes quickly and easily in water, juice or milk or can be used in any of your favorite recipes to increase the protein content. It’s a natural, pure and delicious way to reach your daily protein requirements from the highest biological value protein available. IsoNatural protein powder is extracted through CTP™ (Cold Temperature Process) Microfiltration; this technology employs a truly unique protein extraction technology that suspends pure protein fractions in their native state thereby eliminating the need for harsh chemicals and denaturing heat. This process allows IsoNatural to have an exceptionally high protein yield while maintaining essential bioactive components and extraordinary macrofractions. IsoNatural is a pure whey protein with no artificial flavor, no sugar, no artificial sweetener and no color added. It’s the ideal protein supplement for those looking for a natural option in protein powders. IsoNatural is 100% pure and a natural whey protein. It is now available in three delicious flavor options – Strawberry, Chocolate and Vanilla. Combine 1 scoop (30 grams) of IsoNatural pure whey protein powder with juice or milk at any time during the day that you need a protein boost. IsoNatural mixes well in a shaker cup but can be combined with other ingredients in a blender as a smoothie as well. You can use up to 8 scoops a day. 4. What is IsoNatural sweetened with? IsoNatural flavors are sweetened with Stevia, an herbal extract. No chemical colors or flavors are ever used. 5. Can I add other ingredients such as fruit to IsoNatural? Of course. Combining IsoNatural with fruits or vegetables can create a tasty smoothie and you don’t have to worry about any unnatural ingredients. You can combine IsoNatural with water, milk or any ingredients that you desire. 6. When should I take IsoNatural? You can use IsoNatural anytime of the day to supplement your diet with protein. 7. Is IsoNatural Gluten Free? Yes, IsoNatural is 100% gluten free and ideal for any of those following a gluten-free diet to use. To easily increase your daily intake of the highest quality protein, mix or shake 1 scoop (30 grams) of IsoNatural™ with 177 mL (6 ounces, 3/4 of a cup) of milk, yogurt or juice. 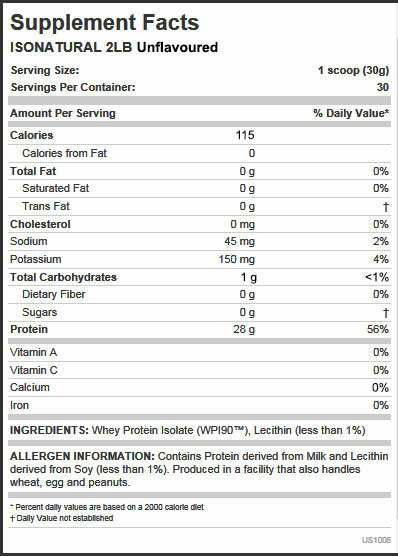 Contains Protein derived from Milk and Lecihin derived from Soy (less than 1%). Produced in a facility that also handles milk (Whey Proteins) and Peanuts.